Did you ever tried to build a sand castle? Probably yes. Felt frustrated it always collapsed unexpectedly? At least I did when I was a child. But it took me an academic study to know why. Lucky you. You just have to read this blog post and experience a moment of enlightenment. So, this is good moment to stand up and get some coffee. You will enjoy reading it more and remember my lecture every moment you take a sip. 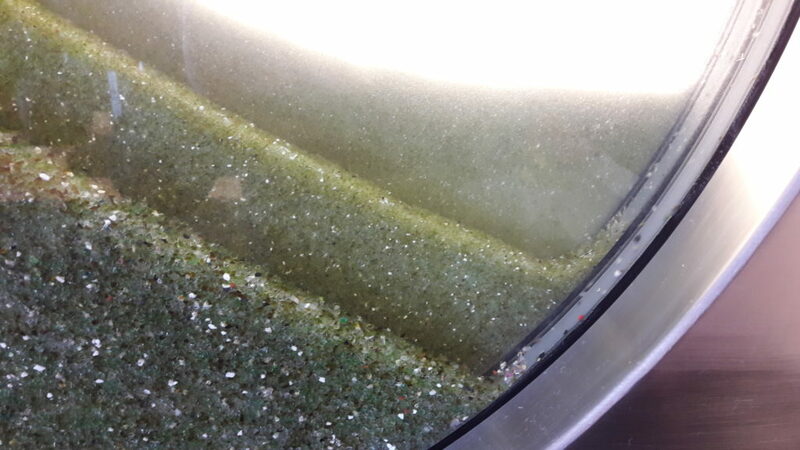 The second exhibit in the Damen Dredging Experience is an installation, which we call: ‘the Bank’. Usually there is some mechanical or hydraulic action, that will cause the sediment, to become unstable. In this exhibit, we can turn the little wheel at the lower right corner. The first thing you will notice is that at the higher end of the soil surface, the grains will slightly move and start to tumble down along the slope. Where the activation of the particles start at the slope is called the active bank. 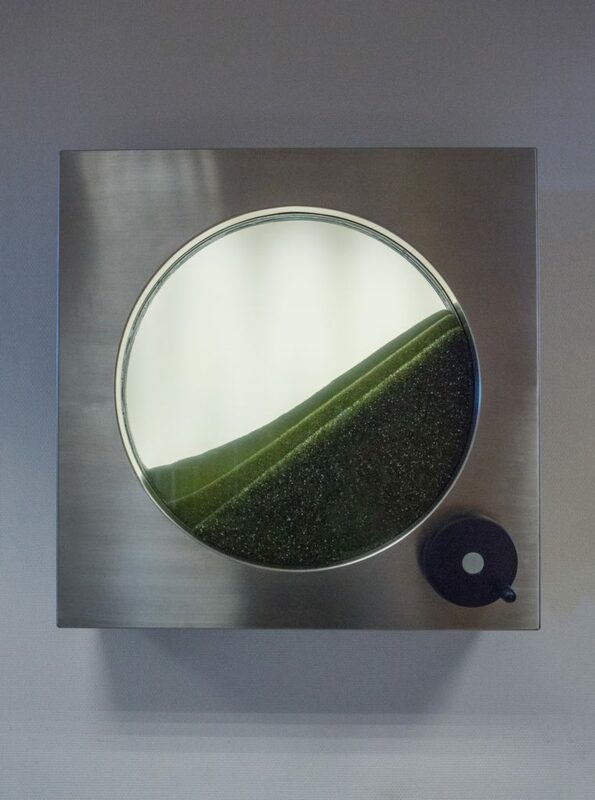 The effect we would like to demonstrate, is that different soil types, do have different behaviour in this process. There are three different soil types, from course to fine, from the front to the back. The finer material at the back seams to stay the longest at rest. This is due to a phenomenon that we call ‘dilatancy’1. If a stack of grains is sheared, they have to hobble over the tops of the layer below. When the grains do hopscotch over each other, they require more space to do so. Effectively the pores increase in volume and the total sediment expands. The extra space cannot be accommodated for by expanding water, it has to be replenished. The extra water has to come from the outside. But the grains themselves are in the way and form resistance to the incoming water. The resistance causes a differential pressure under the ambient pressure, commonly known as ‘vacuum’. And grains under vacuum tend to cling together and form chunks. This happens mostly, when the pores are small, or when the grains are small. Exactly what you can see in the exhibit. Once the sediment is loosened from the active bank, it rolls down the slope, it behaves like a dense fluid, driven by gravity2. When the slope becomes less, or the running fluid encounters resistance, the sediment will settle again at the so called ‘passive bank’. 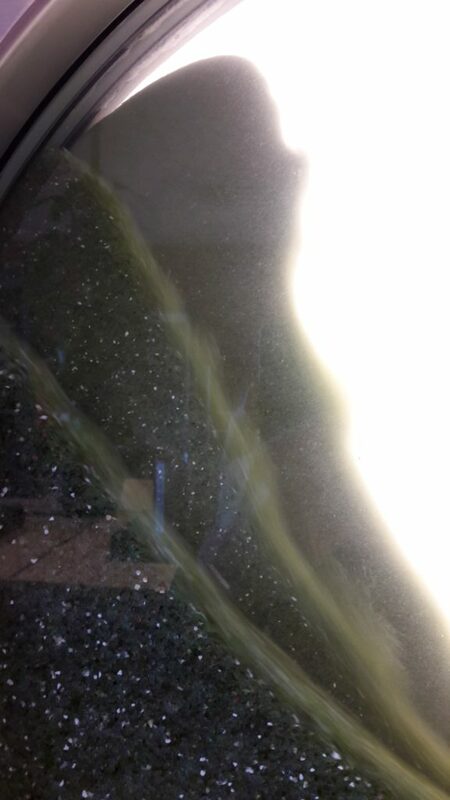 Here the reverse process happens, the water has more trouble getting out of the suspended flow and run longer. The passive slope will be flatter at finer grains than in more coarse material. 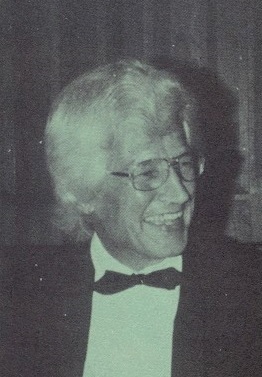 Both processes can be identified in e.g. the DOP3. It is usually suspended on a wire and lowered onto the seabed. Powerful jets excavate a small pit where the suction head takes up the suspended material. The walls of the pit become unstable as an active bank. The loose material flows into the pit. This turns into a continuous process and the active bank, runs away from the suction pit. Now, it is immediately evident, why DOP pumps have this characteristic suction pipe. It fits snugly in the pit and has the least resistance for the incoming density flow. Another benefit of the suction tube, is that if the bank collapses on the DOP, the suction pipe can be extracted without too much trouble. Extracting a pump from under a collapsed bank imposes the same trouble as creating a passive bank: suction due to dilatancy. So, your sand castle collapses when water enters the pores. 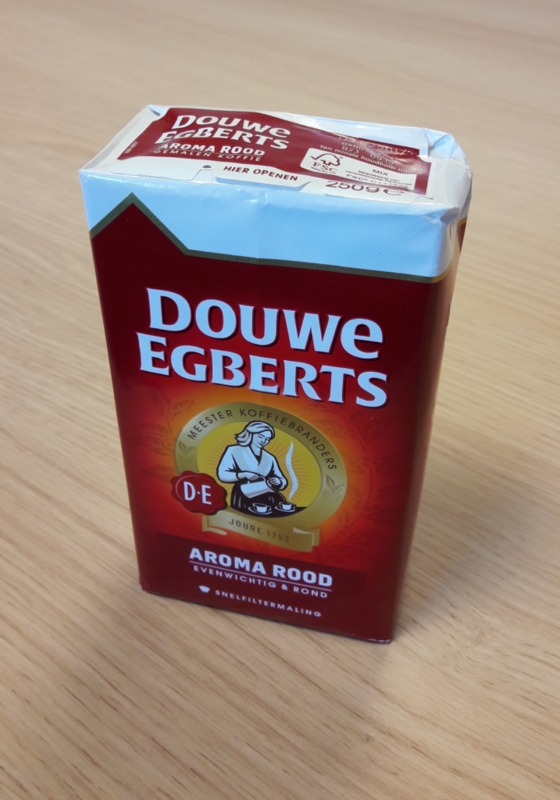 A demonstration of grains becoming as strong as a concrete block by under pressure is a well-known household phenomenon: vacuum packed coffee. Now, you will think of this, whenever you open a new pack of coffee. Sounds familiar? Well to me it does. Sometimes, even our most esteemed customers lack a basic knowledge of their primary process. Often, I’ve been called into a meeting with the customer, to explain about sand and its physical properties. Nowadays, we can show them an exhibit in the Damen Dredging Experience1 to discuss their particular case. 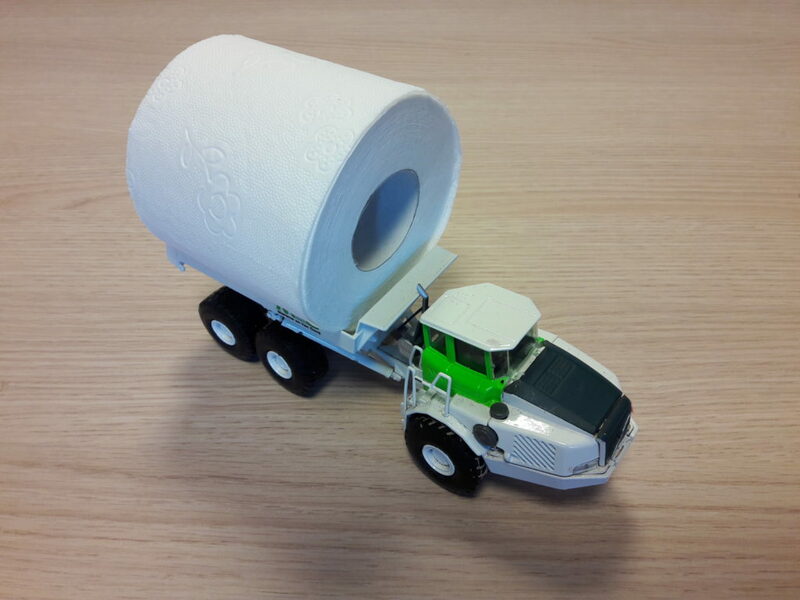 Eventually, we can tease out the information we need, to inform the customer the estimated production of their dredge. Educated customers do know about their operation and can make the estimation themselves. 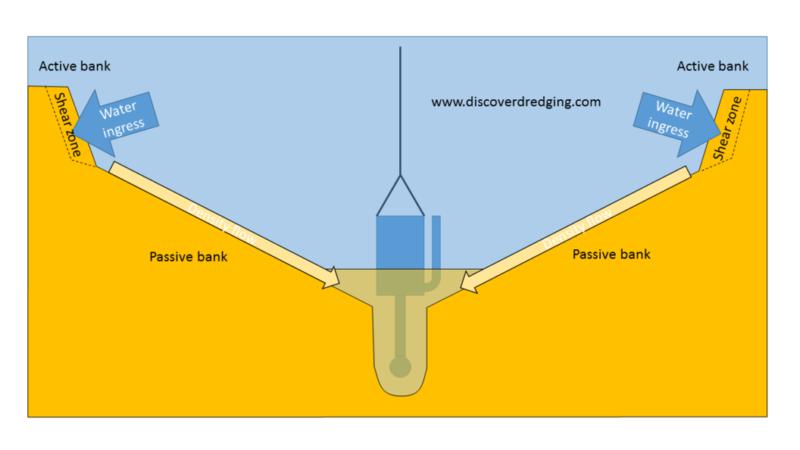 There are several parameters that influence the performance of the dredge. 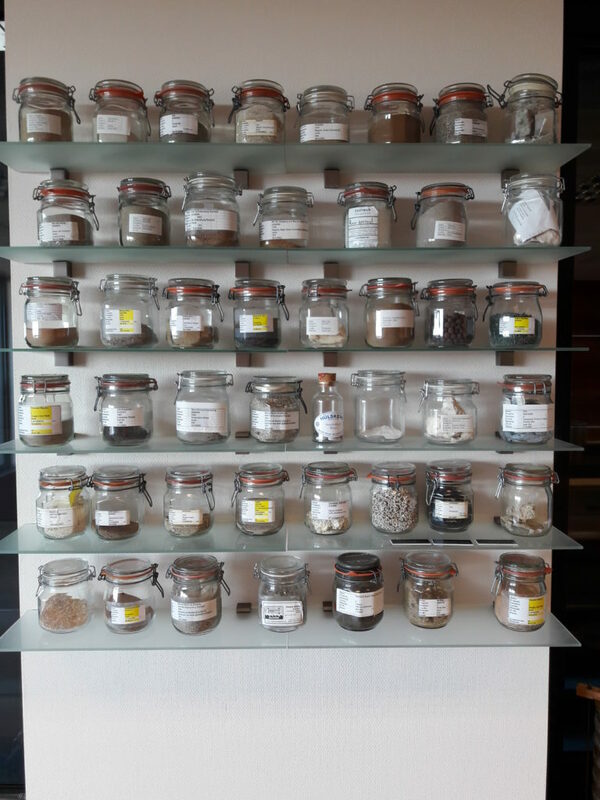 Particle sizes, grain forms, densities, mineral types, cohesion and many more. And we are very happy when the customer already has his own soil report of his particular operation. This would comprise bore logs, particle size distribution and cone penetration tests. If this is not possible, a sample of the concerned soil will do. We do have our own small soil mechanics lab, in which we can measure the required properties. 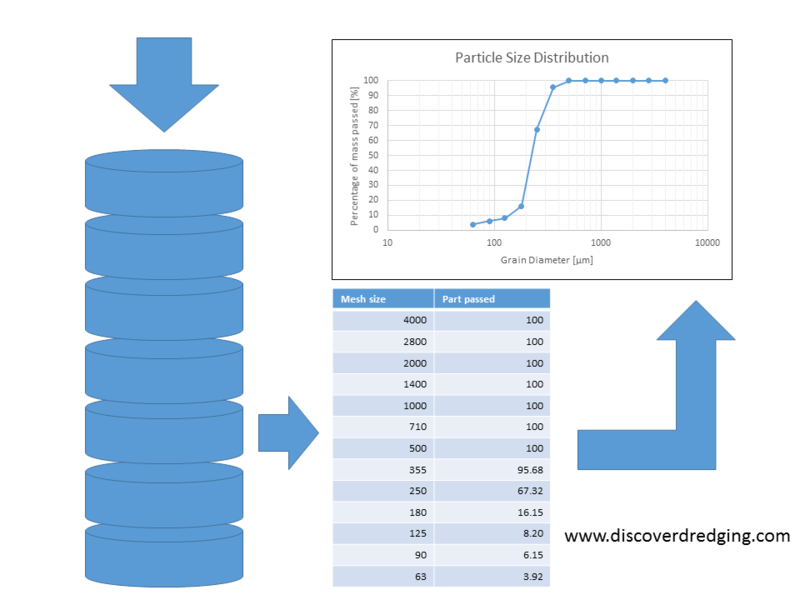 The most useful property is the particle size distribution or PSD. This can be done in a sieve tower. 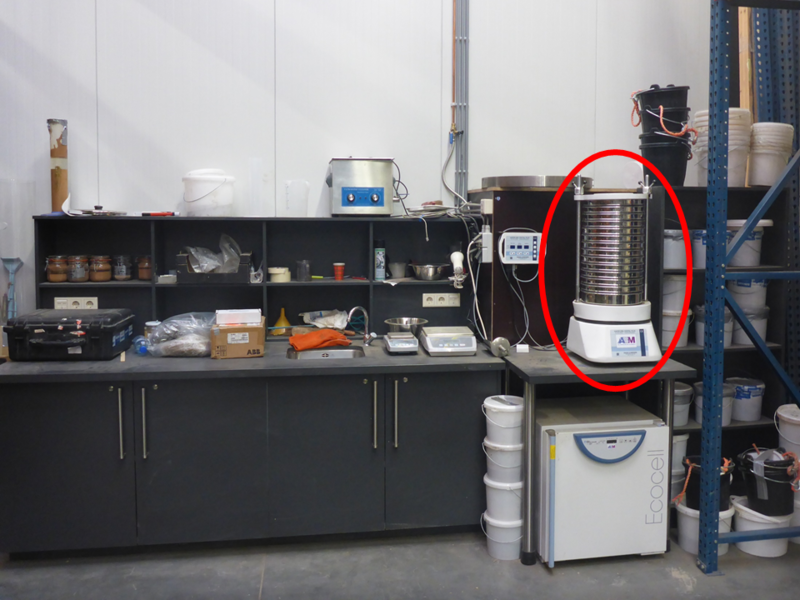 (red circle) The soil sample is placed in the top sieve and the sieves are vibrated to separate the various fractions. The contents of the sieves are weighed and plotted in a logarithmic graph. This resulting PSD can then be used in production estimations. 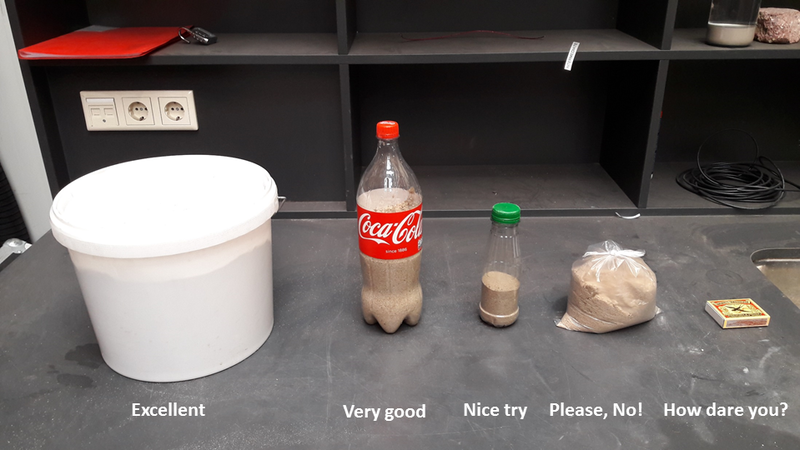 For a good measurement, we need a sample the size of a 1.5L coke bottle. About two thirds of soil and one third of water. We need the water to capture the fines in the sample. Do not drain it! And the bottle is a good container for transport and widely available. Stash it in your check-in luggage. Otherwise, you will run into trouble with the airport security about carrying liquids in your hand luggage. ‘Oh, I don’t know. Just paper’. Sorry folks. It has been several weeks since my last post and I hope you haven’t forgotten my dredging details. This website is just a personal side line that I have to maintain and expand in my own time. Lately my time was rather limited and all my creative capabilities were engaged on an urgent case for my employer. But I do have some thoughts that I wanted to share with you, they just have to wait for better times. Part of my job is, to take care of a ‘Dredging Experience Centre’. A touch and feel museum area, where we can take customers and sales- and service people to explain and discuss about their particular dredging project. I have tons of material for presentations and handouts on this topic, so it will be useful next time, when I am otherwise occupied. I just needed an opening to offer you some perspective on the scattered articles that will pop up sometimes. And what a better opening can be than the opening of the Dredging Experience itself. 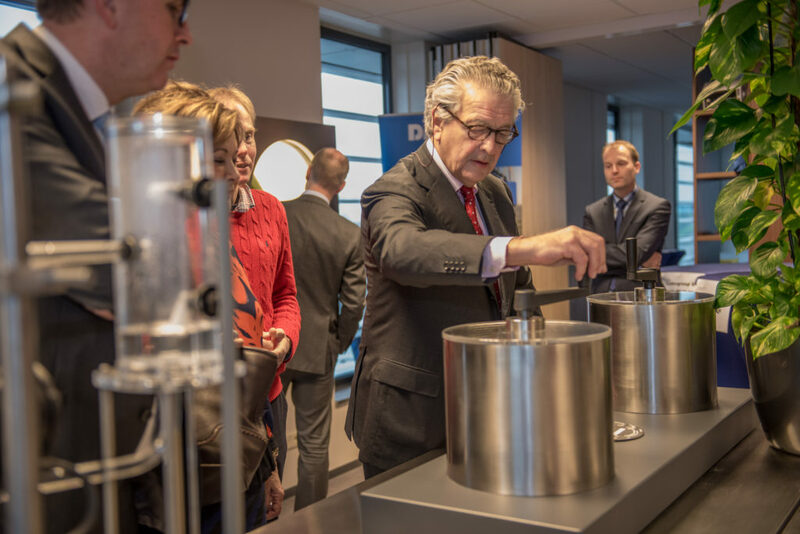 On Wednesday November 16th, 2016, Mr. Kommer Damen himself opened our new office building and received the honour to show him our exhibits1. The starting point of a tour through the dredging experience is the overview poster with all the different processes that are explained with the available exhibits. 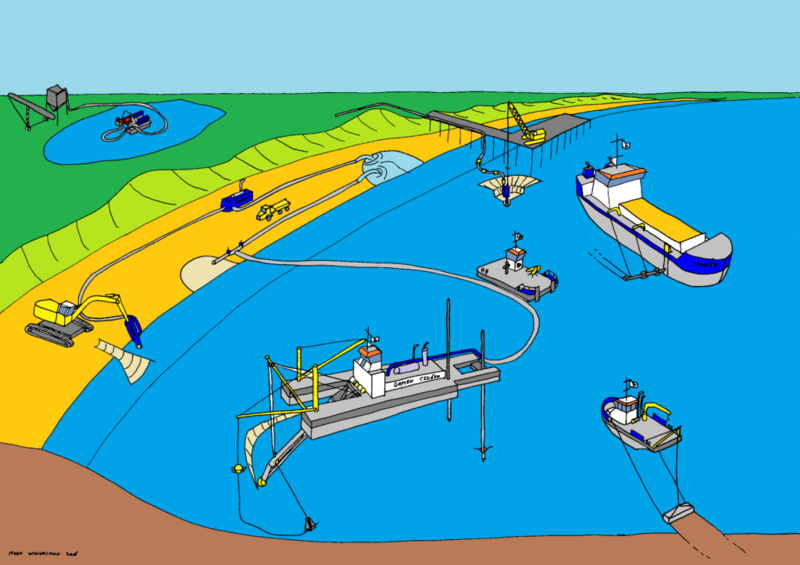 Each process is indicated at the corresponding dredging vessels, that feature the relevant equipment. Processes and phenomena range from basic soil mechanics to fluid dynamics and the influence of the various processes on the total dredge production. There are also exhibits specifically on explaining our design choices, e.g. our mechanical seal. Other exhibits show recent research and development like ‘spud pole holding forces’ and the DynaCover2. The Dredging Experience is exactly what it says: you will be able to ‘experience’ the various processes. Most of them require some manual effort and this will show you the differences in soil properties or hydraulic configuration. This provides an excellent opportunity to have an in depth discussion with clients about their particular dredging project and the best possible solution for their specific requirements. Regularly, I see happy faces of enlightenment coming out of the exhibition. Commercial colleagues when they understand the customer across language barriers. And especially customers as they feel at ease, because they can explain on a practical level about their problem and see how much we go into the details of the dredging process to optimize for their purpose. And even when they walk out without buying, they do so with an everlasting positive impression. They will easily apply the new insights into their daily operation at home.